President Trump’s Hollywood star is back on the Walk of Fame after being hacked away by a man with a pickaxe. On July 25, 24-year-old Austin Clay took a pickaxe to the landmark, defacing the star completely. He was charged in August with felony vandalism, to which he pleaded not guilty. Clay called the vandalism a "rightful and just" act and said that "the repercussions of it were only positive." "I only wanted to bring about positive political change," he said. If convicted, Clay faces a maximum sentence of three years in jail, Fox News reports. 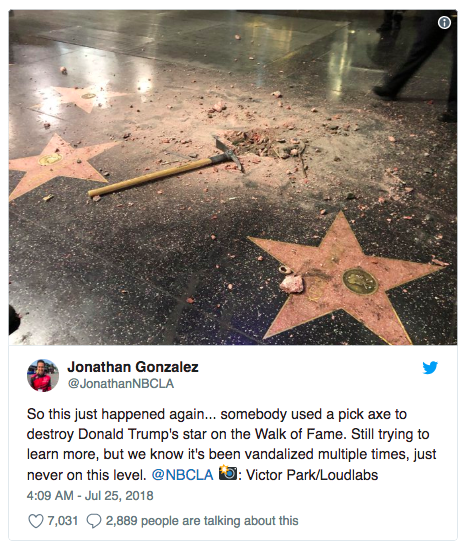 The President and CEO of the Hollywood Chamber of Commerce, which is responsible for replacing any star which is vandalized or destroyed according to Fox News Insider, issued a scathing statement on the vandalism incident. In the statement, Leron Gubler urges people to maintain “respect for the law” and says that “people make a real difference by voting and not destroying public property." "The Hollywood Walk of Fame is a historic landmark which celebrates the professional contributions of the inductees. The stars once installed, are considered part of the historic fabric of the Walk," writes Gubler. "When people are angry with one of our honorees, we would hope that they would project their anger in more positive ways than to vandalize a California State landmark. Our democracy is based on respect for the law. People can make a real difference by voting and not destroying public property." This was not the first time Trump’s Hollywood star was defaced or vandalized, and probably won’t be the last, as people would rather destroy public property than actually engage in public discourse and find common ground on the issues that face Americans across the nation.